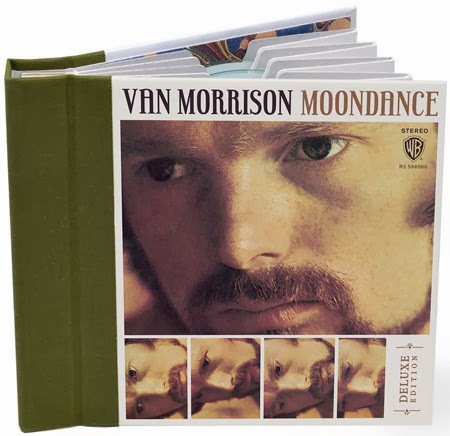 Ask Van Morrison about Moondance and he’ll probably gripe about not making much of any money off the album. Ask anyone else even remotely familiar with the man’s music, though, and it’ll likely be cited as among his best, most beloved works. Released in 1970 it was Morrison’s third solo LP since leaving Them, containing such ultimately classic songs as “Crazy Love,” “And It Stoned Me,” “Caravan,” and the jazzy title track. A new, deluxe edition of Moondance sheds an in-depth and exhaustive light on its creation, yielding dozens of alternate takes as well as previously unreleased tracks and some newly produced remixes. For casual listeners the alternate takes, particularly, which comprise the bulk of what’s included, are too comparable to make this collection wholly worthwhile. Excluding blatant mistakes or abbreviated performances (which are also included), even casual fans would find it difficult to distinguish between many of these session takes from the sides that ultimately made the studio album proper, tougher still to cast a judgment on their most superior versions. This is for die-hard Morrison fans only. With that in mind this deluxe edition offers a great deal to appreciate, including the alternate takes, which even at their most similar yield insight as to Morrison’s perseverance and willpower in summoning exactly what he wanted out of himself and his band in order to deliver the album he sought to make. The previously unreleased material is (not surprisingly) the biggest goldmine here, however, led by the uptempo “I Shall Sing,” a cover of which was later a hit by Art Garfunkel. Other such highlights include a boogie-woogie outtake of the old blues chestnut penned by Jimmy Cox, “Nobody Knows You When You're Down And Out,” and a revved-up and scorching 11-minute performance of “I’ve Been Working”—a less-than-four-minute version was ultimately released later the same year on His Band and The Street Choir—with Jack Schroer’s wailing sax complementing Morrison’s intense, barking vocal. An additional ten-minute version of the latter lacks the same fire. All in all, though, this set should rock the gypsy souls of the most faithful of Morrison followers.